Enjoy peace and relaxation in the beautifully appointed and tranquil Kurland Hotel, which is surrounded by immaculate polo fields. Set amidst emerald green pastures where the foothills of the Outeniqua Mountains sweep down to the warm waters of the Indian Ocean, lies Kurland, a country hotel established by the Baroness Dianne Behr on the age-old Behr family estate near Plettenberg Bay, situated along the famous Garden Route. 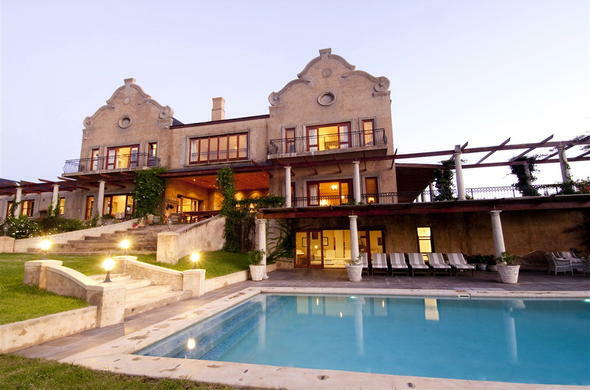 Guests will enjoy peace and relaxation in the beautifully appointed and tranquil reception and sitting rooms of this luxury hotel, which although established in the old Cape Dutch tradition, is completely modern in all other respects and which is surrounded by immaculate polo fields with adjacent stables. Kurland Hotel's Polo Conference Room at The Pavilion measures 10 metres by 8 metres with a ceiling height of 3 metres. Situated on the main polo field about one kilometre from Kurland Hotel, The Pavilion enjoys wraparound views of the mountains, polo fields and paddocks. With an adjoining lounge, bar and dining area, The Pavilion also has a large wooden deck suitable for tea breaks and drinks. Fitted with audio-visual equipment such as a flipchart, whiteboard, overhead projector, screen, video projector and video machine, Kurland Hotel's Polo Conference Room accommodates a minimum of 8 and a maximum of 15 delegates seated in a U-shape. Kurland is delighted to offer enticing Spa packages combining a symphony of treatments and leisure activities designed to begin rejuvenating and restoring one's body and soul.